Nina Davenport grew up in Bloomfield Hills, Michigan. After studying photography and filmmaking at Harvard College, she completed her first film Hello Photo, a poetic travel documentary about India, in 1994. The film premiered at Rotterdam and won "Best Documentary" at the Melbourne International Film Festival. Her second film Always a Bridesmaid described by the Hollywood Reporter as "dripping with artistic merit" — was autobiographical, and aired on Cinemax/HBO and Channel Four in the U.K.
Davenport's third feature, Parallel Lines, a lyrical road movie about the private stories and personal grief of Americans in the aftermath of September 11th, premiered at IDFA (The International Documentary Film Festival in Amsterdam) in the Joris Ivens competition, and subsequently aired on the BBC's "Storyville." Operation Filmmaker, her most recent film, first screened as a work-in-progress at the Rotterdam International Film Festival in 2007, where it won the prestigious KNF Dutch Film Critics Award, and later premiered at the Toronto International Film Festival. 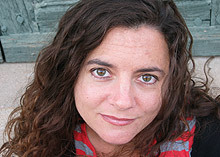 Davenport's unique and personal style of documentary has earned her numerous filmmaking awards and grants. She currently lives and works in New York City.